The United Nations has gone mobile…in a big way. In just a few clicks I found more than 10 iPhone apps covering everything from news to statistics to global photos. The app makes it easy to get involved and includes some innovative (and fun) ways to learn about the work of the United Nations. 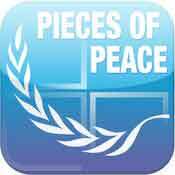 An interactive photo-scramble game, “Pieces of Peace,” gives users the ability to have fun while they learn by unscrambling photos taken around the world that are related to the work of the UN. The game includes ways for users to learn as they play, helping build awareness and knowledge about international issues. Integrated social media options also allow users to organically share this content with friends, brag about their photo-unscrambling prowess, and encourage them to get involved. 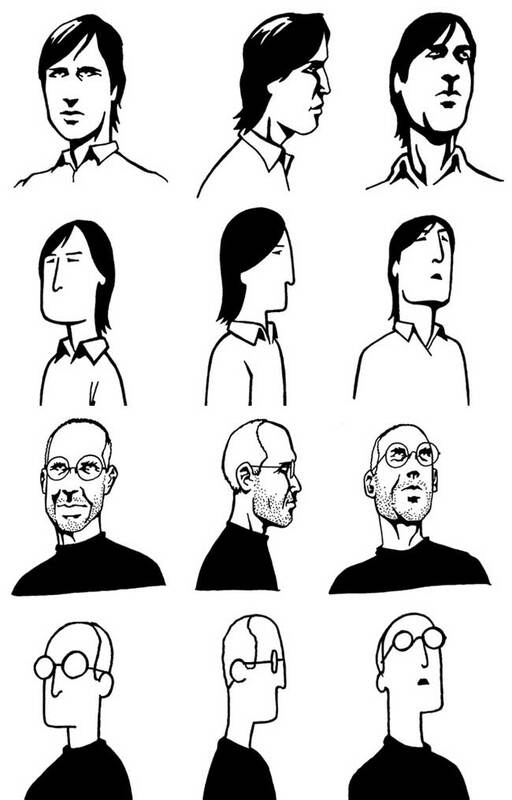 Check out the entire collection at JESS3 and the book, The Zen of Steve Jobs. 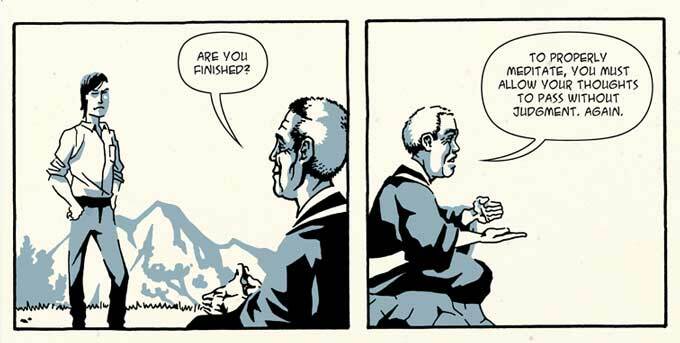 Kobun was a Zen Buddhist priest who emigrated to the U.S. from Japan in the early 1970s. He was an innovator, lacked appreciation for rules and was passionate about art and design. 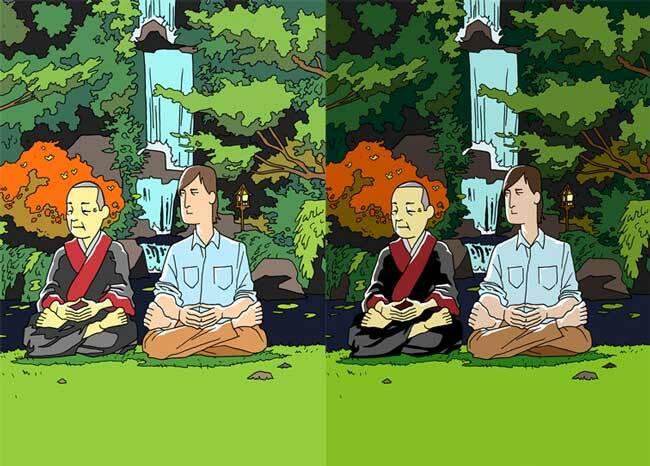 Kobun was to Buddhism as Jobs was to the computer business: a renegade and maverick. It wasn’t long before the two became friends–a relationship that was not built to last. 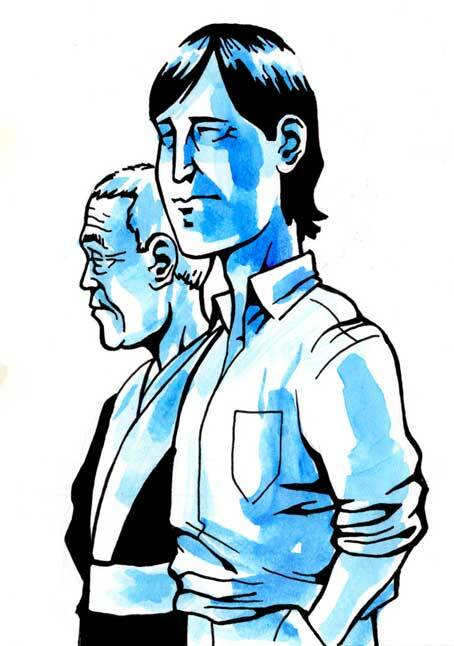 This graphic book is a reimagining of that friendship. 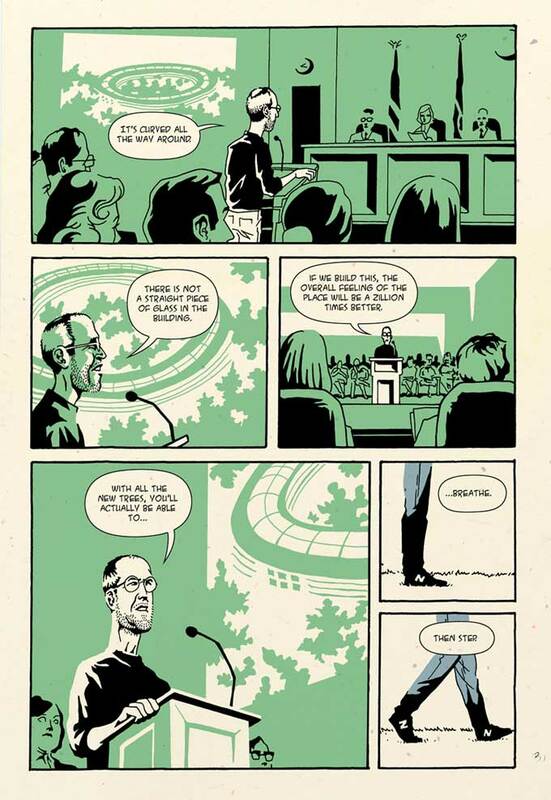 The story moves back and forward in time, from the 1970s to 2011, but centers on the period after Jobs’ exile from Apple in 1985 when he took up intensive study with Kobun. Their time together was integral to the big leaps that Apple took later on with its product design and business strategy. Here is another awesome project from JESS3. ESPN was looking for a way to make the explanation of how the TV ratings systems works simple and interesting—at least engaging enough to keep the audience awake. With direction to create something reminiscent of “Schoolhouse Rock,” meets “Sesame Street,” JESS3 created a five-minute animation with an old-school, 1970’s ESPN SportsCenter vibe to walk viewers through the television ratings process. There is also a behind the scenes video and raw photos of the creative process. This weekend, something special happened. And I’m not referring to the fact that Steve and I got up before 9AM on a weekend. A group of women (and a couple men) came together voluntarily on their own time to teach and learn how to edit Wikipedia. For 4 hours, 20 of us sat in the kitchen area of JESS3 headquarters and talked and learned and had a genuinely fun time. As I’ve written previously, it’s critical to have a diverse body of people contributing to Wikipedia since it’s key to making it reliable as a neutral knowledge resource. 2. Begin on home turf. Start by creating you own User page and play around with formatting there. Most Wikipedians respect individual User pages and won’t touch them. 3. Be bold. No one owns Wikipedia. Your contributions count just as much as everyone else’s. You can’t break Wikipedia. Nothing is ever lost if you change or remove something. 4. Use logic and tenacity. Sometimes edits you make will get deleted (or reverted). It happens. If you believe in your edits, use logic and tenacity to make them stick. 5. Talk it out. If you encounter a conflict or don’t understand why an edit you made is reverted, leave a message on the person’s Talk page to elaborate. You can see who reverts an edit page by the View History tab. 6. Don’t take it personally. Sometimes edits get reverted. It happens. Sometimes people are in pissy moods and take it out in Wikipedia. It happens. Don’t let this deter you from contributing. Learn and grow from it. 7. Find a buddy. Ask friends if they know how to edit Wikipedia. Or check out your local area for Wikipedia:Meetups and go and make some friends. Most Wikipedians are generous with their time and knowledge and will happily help out a beginner. You can also get “adopted” to be mentored via the Adopt-a-user program. 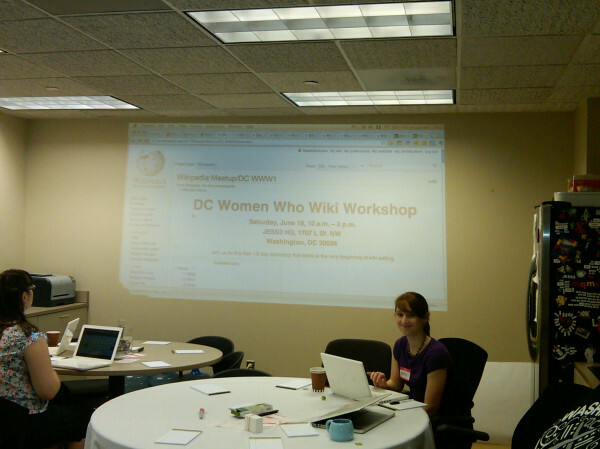 There’s an old proverb: Action is the proper fruit of knowledge – which is why 1X57 is offering a free workshop (drawing upon our days of running training for the Intellipedia Sabbatical) in DC next week for women and girls to learn how to edit and contribute to Wikipedia. Less than 13% of the Wikipedia editors are female. Sue Gardner, the Wikimedia Foundation’s Executive Director, shared Nine Reasons Why Women Don’t Edit Wikipedia (in their own words). The reasons listed are not insurmountable. In fact, individually they’re all fairly easy to address. Much of the solution lies in knowledge and awareness. But a solution is needed because a user-contributed encyclopedia primarily built by the contributions of twenty-something, single, white males inherently leaves gaping holes in shared knowledge. Or even worse, inherent biases. Teaming up with DC Web Women‘s Girls Rock On the Web, JESS3 (who will be hosting the event at their office in DC) and Andrea Baker and Kirby Plessas who will be our Guest Gurus, we have a sold-out event. We also created a page for the workshop in Wikipedia itself and added the event to the scheduled future Wikipedia:Meetups list. Who are the best in DC Tech? Have you ever met one of those PhD’s from a third world country. You know someone that used to be well-esteemed and then their country fell apart. So when you meet them they are working as a security guard but telling you stories about human genomics? That’s kinda how I feel leaving the Intelligence Community. For years I have been laboring away inside their networks, building them, growing communities, and finding success. Now I am leaving, branching out into the wider world. My first step is to survey the DC Tech scene. I’ve found that the Facebook group DC Tech is pretty much awesome and we are on the verge of having our own twitter hashtag #DCTech. Posted on December 10, 2010 Author robotchampionCategories default, TechnologyTags allyson kapin, angie goff, city girl blogs, DC, DC tech, debbie weil, frank gruber, geoff livingston, istrategylabs, jen consalvo, jess3, jesse thomas, jill johnson, kate michaels, kstreetkate, lesslie bradshaw, mark drapeau, pamela sorenson, pamelas punch, tech, techcocktail, top, top 5, top5, walt mossbergLeave a comment on Who are the best in DC Tech?